Los Angeles is one of the most beautiful places in the world for a romantic date. This diverse city has everything from gorgeous beach sunsets to unique and interesting restaurants. You’ll have difficulty choosing what to do first! The Los Angeles County Museum of Art is a glorious place to start endless conversations between you and your date. With exclusive art pieces, installations and exhibitions, this breathtaking experience will leave you both in awe. Seeing what she is drawn to and affected by will give you some insight into her nature also. A visit to Franklin Canyon Park is the perfect escape from the city for some fresh air and scenic walks. You can enjoy a romantic picnic or just relax, taking in the beautiful surroundings. Same goes for Malibu; fresh air and expanses of beautiful pristine beach to stroll along. Perfection. For an experience that will stimulate your senses, you could try the Opaque restaurant. This uniquely famous restaurant removes all visual stimulation leaving you free to focus on simple sounds, tastes and textures – it’s lights out here. Dining in the dark can be very appealing! Time to put your cell phones away and see where your culinary journey takes you. No romantic visit to Los Angeles would be complete without a trip to Crystal Cove. This 3.2 miles of beach remains largely unspoiled. 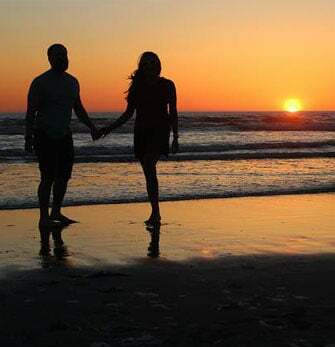 Everything about it is romantic, from a lovely, leisurely stroll along the waters edge, to dipping your toes in the cool water as you watch the sun go down. No two beaches are the same, so indulge wherever possible. If you’re in the mood for something more lively, try A Club Called Rhonda. You can dance the evening away, and get a little closer in the process. A place where music, dancing and fashion collide to make the best party atmosphere. Let your hair down and have some fun together! For the ultimate fun date, for those who are a little more whimsical, you have to experience some of the amusement parks in Los Angeles. Go on some wild rides together and make some magical memories. Don’t miss iconic hot spots like the Magic Kingdom’s Castle where you can relive you childhood with someone special!